Florence Carala and Julien Tavernier are lovers who plan to kill Florence's husband, Simon Carala, a wealthy industrialist who is also Julien's boss. Julien is an ex-Foreign Legion parachutist officer and a veteran of the Indochina and Algeria wars. After working late on a Saturday, with a rope he climbs up one storey on the outside of the office building, shoots Carala in his office without being seen, arranges the room to make it look like a suicide, and then makes his way out to the street. As he gets into his Chevrolet convertible outside, he glances up and sees his rope still hanging from the building. Leaving the engine running, he rushes back and jumps into the elevator. As it ascends, the caretaker switches off the power and locks up the building for the weekend. Julien is trapped between floors. Moments later, Julien's car is stolen by a young couple, small-time crook Louis and flower shop assistant Véronique. Florence, who is waiting for Julien at a café nearby, sees the car go past with Véronique leaning out of the window. She assumes that Julien has run off with her and wanders the Paris streets despondently all night asking for him in the bars and clubs where he is known. While joy-riding, Louis puts on Julien's coat and gloves. Checking into a country motel, the two register under the name "Mr. and Mrs. Julien Tavernier" to avoid problems for Louis, who is wanted for petty crimes. At the motel, they make the acquaintance of Horst Bencker and his wife Frieda, a jovial German couple on holiday with whom they had raced en route to the motel. After Frieda takes pictures of Louis and her husband with Julien's camera, Véronique takes the film to a photo lab beside the motel for developing. After the Benckers go to bed, Louis attempts to steal their Mercedes-Benz 300 SL. Bencker catches Louis and threatens him with what appears to be a gun, though it is really a cigar tube. Louis shoots and kills the couple with Julien's handgun. He and Véronique return to Paris and hide in her flat. Convinced that the crime will be traced to them, Véronique persuades Louis to join her in a suicide pact. They take an overdose of pills and pass out. The Benckers' bodies are discovered, along with Julien's car, handgun, and raincoat. Julien therefore becomes the prime suspect in their murders, and the morning newspapers print his picture. Searching for him, the police arrive at the office building with the caretaker, who unlocks the entrance doors and switches on the power. The elevator is working once more, and Julien is able to escape without being seen, but when he orders coffee and croissants in a café, he is recognized, and the police are called to arrest him. In the office building, the police discover Carala's body but assume he committed suicide. However they charge Julien with killing the Benckers, refusing to believe his alibi of being stuck in an elevator. Florence is determined to clear him and sets out to find Véronique. She and Louis, their suicide attempt having failed, are alive but drowsy. Florence accuses them of killing the Benckers and goes to call the police. Louis at first thinks there is no evidence to connect him with the crime, but Véronique remembers the photographs of him with Bencker. Rushing to the photo lab, Louis finds that the police have developed the pictures, and he is arrested. Florence has followed him, and when she enters the lab, the police show her the photographs taken with Julien's camera. These make clear that she and Julien were secret lovers, who shared a motive for killing her husband. Both will go on trial for Carala's murder. Malle cast Moreau after seeing her in the Paris stage production of Tennessee Williams' Cat on a Hot Tin Roof. The film's score is considered by many as groundbreaking. The score by Miles Davis has been described by jazz critic Phil Johnson as "The loneliest trumpet sound you will ever hear, and the model for sad-core music ever since. Hear it and weep." Moreau had 20 forgettable films behind her. ... Malle put Moreau under an honest light and wisely let his camera linger. The film was nothing special, but it did accomplish one thing: it proposed a new ideal of cinematic realism, a new way to look at a woman. All the drama in the story was in Moreau's face – the face that had been hidden behind cosmetics and flattering lights in all her earlier films. When Malle [made] The Lovers the following year, it was obvious who his woman would be. For one thing, he had discovered her, and for another, they were in love. The film holds a 93% "Certified Fresh" rating on Rotten Tomatoes, based on 50 critic reviews. The film also holds a rating of 94/100 on Metacritic, indicating "universal acclaim." In a 2005 review for the film's theatrical re-release, Roger Ebert noted that Moreau's face, when Florence is pondering Julien's whereabouts, "is often illuminated only by the lights of the cafes and shops that she passes; at a time when actresses were lit and photographed with care, these scenes had a shock value, and influenced many films to come." He further argued that Louis and Veronique were an important precursor to the controversial young couple of Jean-Luc Godard's better-known Breathless (1960). Calef's novel has been filmed twice since Malle's version: one by Japanese filmmaker Akira Ogata in 2010 as well as a Russian adaptation by Stanislav Govorukhin titled Weekend in 2013. ^ Linda Rasmussen. 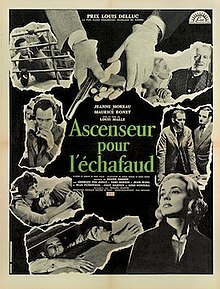 "Ascenseur Pour L'Echafaud - synopsis". AllMovie.com. Retrieved 5 October 2013. ^ a b Daniele, Romina (2011). Ascenseur pour l'échafaud, Il luogo della musica nell'audiovisione. Milan, Italy: RDM. ISBN 9788890490590. A detailed analysis on the movie and on this relationship from a critical, linguistic and aesthetical point of view, can be found on this book. ^ Phil Johnson, "Discs: Jazz—Miles Davis/Ascenseur Pour L'Echafaud (Fontana)", Independent on Sunday, 14 March 2004. ^ Farrell, Barry, "Actresses: Making the Most of Love" (subscription access only), Time cover story pp. 4-5, 5 March 1965. Retrieved 21 March 2015. ^ "Ascenseur pour l'échafaud (Elevator to the Gallows) (Lift to the Scaffold) (Frantic)". Rotten Tomatoes. Retrieved 21 November 2016. ^ Ebert, Roger (15 September 2005). "Elevator to the Gallows Movie Review (2005)". Retrieved 26 July 2016. This page was last edited on 18 February 2019, at 15:04 (UTC).